Drain and rinse black beans. Drain corn and combine in a medium-large bowl. Add olive oil and lime juice. Chop onions and cilantro and combine with beans and corn. Cook couscous while chopping. Add salt, black pepper, red pepper and cumin. Stir in cooked couscous a small amount at a time. 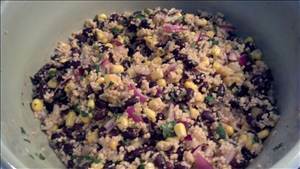 There are 152 calories in 1 serving of Couscous with Corn & Black Beans. Calorie break-down: 17% fat, 67% carbs, 16% protein.